Preparations are well under way for Euro Mine Expo 2014. The event is quickly becoming one of the more popular mining fairs in Europe. Why not? 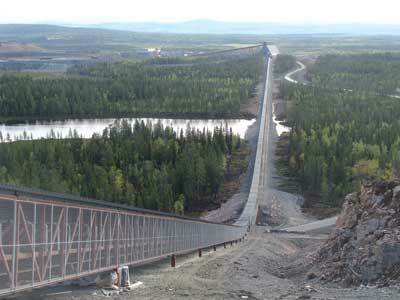 Sweden has been ranked by the Fraser Institute as the No.1 mining-friendly jurisdiction. 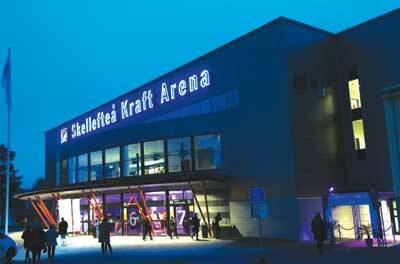 The venue, the Skellefteå Kraft Arena in central Sweden, is located near some remarkable mines in a region many mining equipment vendors call home. 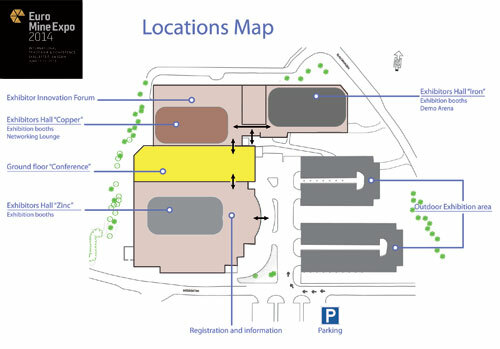 All of the indoor exhibit space at the venue, pictured here, has been booked for the upcoming Euro Ming Expo 2014, to be held June 10-12 in Skellefteå, Sweden. 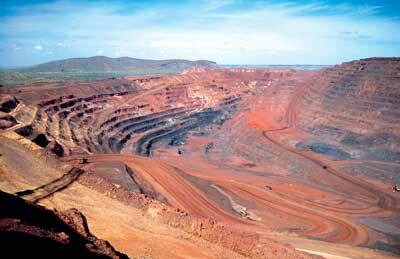 Swedish iron ore miner LKAB is the largest exhibiting company. Of the nine companies sponsoring the event (Atlas Copco, Bergteamet, Björkdal, Boliden, Northland Resources, Outotec, Raw Materials Group, SRK Consulting and Nasdaq OMX), three are mining companies. Other mining companies, such as Agnico Eagle, LKAB and Zinkgruvan, are also exhibiting at the event. In addition to talking to potential customers, suppliers and subcontractors, many of the mining companies are actively recruiting, Tengman explained. “The mines in Sweden are thriving and the companies are searching for talent,” Tengman said. “We have also been working with the technical universities to introduce more students to future employers.” While Euro Mine Expo certainly has a Nordic theme, the event is attracting interest from other European countries and beyond, as can be seen from the technical program outline and the list of exhibiting companies. The three-day event kicks off in the afternoon on Tuesday, June 10 with opening remarks from one of the organizers, Lennart Gustafsson, chairman, Georange. Magdalena Andersson, governor, County Administrative Board of Västerbotten, will preside over the opening. Jonas Hafström from Sweden’s Ministry for Foreign Affairs will discuss the significance of the mining business. In his keynote address, Lars-Eric Aaro, CEO, LKAB, will set the tone for the event. A technical program runs through the course of the event. The first session focuses on mining and Europe. The second session will discuss investments in the mining industry and the program will conclude on Thursday, June 12, with presentations covering recent technological advances taking place in the industry. “The program committee has put a lot of effort into finding great speakers that everyone will find interesting,” Tengman said. A number of other satellite workshops and discussions are orbiting the main technical program along with three field trips to mining-related points of interest in the region. The organizers have also created a networking opportunity for the delegates. “In 2012, we had Match Making hosted by Enterprise Europe Network for a fee and now that is included in the registration for all delegates,” Tengman said. “Delegates can book meetings with each other through an interactive calendar. Almost half of the current registrants have elected to participate in this program. The ability to pre-book meetings is very popular.” Several hospitality events also have been organized for the early evening hours. Participation in these ticketed events is limited. Tengman promises that the food will be spectacular. Alimak will display its rack and pinion elevator. The elevators are a perfect solution for underground as well as aboveground applications, such as pelletizing plants, smelters, concentrators, crushers and other ore processing plants. Since the introduction of the Raise Climber in 1957, the “Alimak Method” has been used to drive more shafts and raises than any other raise climber system, increasing mining productivity and raising industry safety standards. With Raise Climber now sold exclusively through Arkbro Industries, Alimak Hek’s focus today is on industrial elevator solutions. 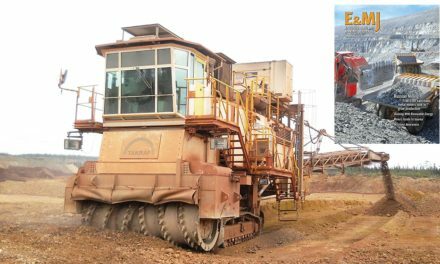 Three elevators for Crushing Services International, Christmas Creek mine, Australia. Atlas Copco recently launched a new, 18-metric-ton (mt) capacity underground loader for large operations including development work as well as production mining. The company expects the Scooptram ST18 to be the most productive LHD on the market and it will showcase the LHD at Euro Mine Expo. The machine was designed to match the 60-mt capacity Minetruck MT6020. The two pieces of equipment share many common parts and control system components, which can substantially reduce total cost of ownership. The bucket and the boom design combined with variable displacement pumps provide safe and efficient operations. This, together with the Rig Control System, which monitors, supports, and controls all aspects of the operation, results in superior muck pile penetration, less wear and tear on the machine, and an overall faster and more productive loading cycle, according to Atlas Copco. CraneX AB offers services such as maintenance and modernization of hoists, cranes, telfers and industrial gearboxes.The company offers solutions with high focus on customer need, reliability and safety. The areas of expertise include service, modernization, and new deliveries of lifting equipment and rotating machines. Dynaset is a leading manufacturer of hydraulic generators, power washers and compressors. The company has created a whole new industry of equipment powered by hydraulics that transforms hydraulic power of a machine into electricity, high-pressure water, compressed air, magnet, vibration, etc. for hundreds of different applications. Dynaset equipment increases productivity of customer’s mobile machinery by diversifying its features. Zero emission Dynaset equipment runs without extra engines or additional fuel. Dynaset equipment is integrated in a machine and they are always ready to use. The Italian radar manufacturer, Ingegneria dei Sistemi IDS, with more than 100 installations of its radar systems in open-pit mines all around the world, is defining a new standard in the safety critical slope monitoring for the mining sector. The long record of successfully tracked failures has been possible by the innovative radar technology employed by the IDS IBIS radar. The IBIS system is based on a Synthetic Aperture Radar (SAR) technology, which is able to provide the highest spatial resolution at the longest range distance available on the market, along with the fastest acquisition time. These features fulfill the needs of both safety critical slope monitoring and background monitoring of the largest mines currently in operation. For more than a decade, PANalytical has provided a wide range of analytical solutions for process industries. Since 2010, this has included the Controlled Neutron Analyzer (CNA), which features PFTNA (Pulsed Fast and Thermal Neutron Analysis), a state-of-the-art neutron tube technology. The CNA was first used in the cement industry to measure and control the quality of their raw materials. More recently, the applications for PFTNA have grown to include other materials and industries—hard and soft rock mining. To meet the demands of these varied applications, PANalytical has introduced the CNA3 for a number of different applications. The core of the CNA is unchanged. The unit employs Sodern Neutron Technology that includes their long-life neutron tube (more than 12,000 working hours) and durable BGO (Bismuth Germanium Oxide) gamma ray detectors. The CNA3 features a new configuration specifically designed for the high-belt loading found in these industries. Since both the neutron tube and the detectors are located underneath the belt, the CNA3 can fit virtually any size belt and accommodate a wide range of belt loadings. The small unit (1,200-mm wide x 1,400-mm long x 615-mm high) is installed on a rail system that slips under the belt. This significantly reduces installation effort and allows simple removal for calibration and maintenance without interrupting production. A CNA3 Iron was recently commissioned at an LKAB mine. The unit was first installed in a test configuration on the surface. After passing all of the preliminary tests, the unit was approved for underground installation and is currently operating 815 m underground and providing real-time analyses of the material exiting the mine. Sandvik HM150 formed conveyor rollers installed on an overland at the Aitik copper mine. Longer life with increased capacity and lower energy consumption (lower CO2 emissions), quiet and easy handling; these are the benefits Sandvik targeted when designing its new generation of formed conveyor rollers. The HM150 is now performing successfully in the new overland conveyor at the Aitik copper mine. Higher belt speeds and heavier loads pose additional challenges to rollers as far as bearing life, noise and power demands. A conveyor roller fails prematurely because of bearing overload or contamination, excessive shaft deflection, vibration or shell wear and/or corrosion. Sandvik rollers are designed to provide a quality product addressing all of these issues. 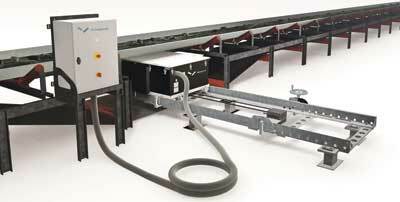 The HM150 is a formed roller to operate in applications characterized by conveyor capacities ranging from 3,000 to 50,000 tons per hour, belt speeds from 4 m/s to 12 m/s and belt widths from 1,400 to 3,000 mm. Based on innovative and new design and optimized components and manufacturing processes, the formed rollers operate longer, quieter and consume less energy than traditional high-speed rollers. The increased roller life, reliability, and energy efficiency create new opportunities to reduce downtime and maximize belt speed. SRK has established a team of engineers (above) who focus on mining in the region. 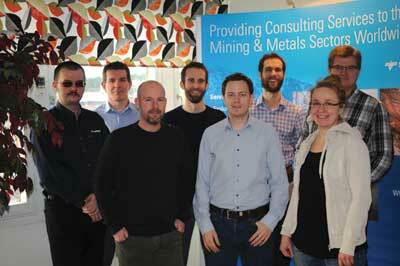 SRK Consulting (Sweden) AB was established in 2009 in Skellefteå, Sweden, to support mining operations and development projects in the Nordic region. The company has been associated with Euro Mine Expo since 2010. At this year’s conference, SRK will present two talks and hold a technical workshop. Dr. Päivi Picken, senior consultant (environment), will present: Environmental Permitting Experiences in Finland and Sweden—Differences, Challenges, Primary European Union Legislation, as part of the main conference program. In addition, SRK will be presenting on “Implicit Modeling” and also the application of an “Integrated Approach in Hydrogeology” at the Exhibitors Innovation Forum. The workshop will be held by Dr. Xander Gwynn, senior consultant (Geotechnical Engineering), Maxim Lesonen, consultant (Mining Engineering), and Michael Di Giovinazzo, senior consultant (Geotechnical Engineering). With more than 220 years of experience, Teufelberger manufactures steel wire ropes for ropeways, cranes and shaft hoists. For shaft hoists guide ropes, the company offers both locked coil and half locked coil ropes. More recently, the company has introduced the Solitec hoisting rope and TEKA Mining hoisting ropes.